LAS VEGAS -- Danny Garcia stopped heavy favorite Amir Khan in the fourth round to stay undefeated and add another super lightweight belt to his collection on Saturday night. "I always knew I would win this fight," Garcia said. "I needed a great fighter in front of me to show how great a fighter I am. Now everyone knows." Khan bruised Garcia early, even opening a small cut above his eye. But Garcia sent Khan to the canvas in the third round with a left hook, but the 2004 Olympic silver medalist for Britain was able to beat the count. At the start of the fourth, though, Garcia swarmed him with power punches, knocking him down twice quickly. Khan got back to his feet each time, but the referee ended the bout at 2:28 of the round. 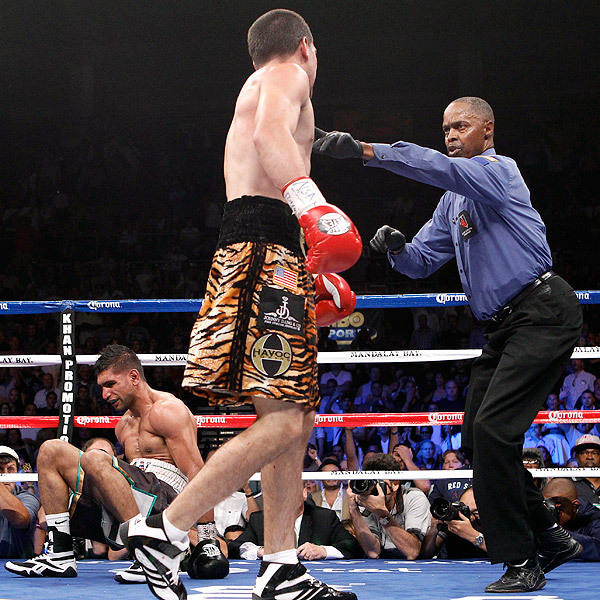 Referee Kenny Bayless sends Danny Garcia, center, to a neutral corner after Garcia knocked down Amir Khan, left, in the fourth round Saturday. "It wasn't my night," Khan said. "I was coming in with my hands down and Danny took advantage of that. He countered very well against me." The American now has the WBA title to go along with his WBC one. He improved his record to 24-0 with 15 knockouts while Khan fell to 26-3 with 18 KOs. Khan was originally scheduled to face Lamont Peterson on May 19 in a rematch of their Dec. 10 bout in which Peterson took a 12-round split decision to win Khan's WBA and IBF titles. Just days before the bout, Peterson tested positive for synthetic testosterone. The fight was canceled and he was stripped of his WBA title which was later restored to Khan. Garcia, who beat Erik Morales for the WBC title on March 24 agreed to fight Khan and took full advantage of the opportunity, defeating the popular fighter in spectacular fashion.